About Us – Get Kids Outside! My name is Kirsty and I run the Get Kids Outside website. I have two children aged 10 and 12, one has a passing interest in nature, the other is very much interested! I’m setting up this blog to encourage and inspire others to do as we have done and also to try and encourage ourselves to keep it up as we enter the teenage years! I hope to include ideas for nature activities and projects, ideas for recording finds, and resources to help foster the hobby if it becomes a new found love! I want nature and wildlife to be accessible to all so the ideas here will hopefully stay simple, cheap (or free!) and doable whether you live in the centre of a city, on the edges of moorland or beside the sea. You can expect a post around about two times a week or perhaps more when it’s the holidays or if the weather has been good! If you’d like to stay updated to the blog you can subscribe to our RSS feeder or you can find us on Twitter and Facebook. I’d love to hear from any readers so do get in touch! You can also get in touch using our contact form. So, a little bit about us as a family. We all had an interest in nature, but really started with very little actual knowledge. In our quest to get out more but spend less money we spent 2010 and 2011 looking for free days out and so ended up going along to lots of events which happened to coincide with nature and wildlife. Our knowledge expanded so much and we have a new found appreciation and interest in the outside world and the life that exists there. We’re not experts by any means, but we have enthusiasm! 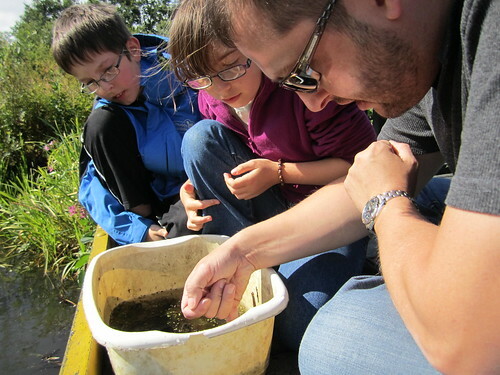 We’ve even taken the kids travelling to explore more of the nature round the world – you can see our travel blog here. I think that getting outside in nature is one of the greatest things we can do for our kids and best of all it is FREE! Some people seem to think that as a whole our kids are growing up with some sort of Nature Deficit Disorder, I say ‘let’s prove them wrong!’ I come across kids and parents all the time who love spending the time outdoors, we just need to provide access, inspiration, freedom and encouragement.